This A-frame cottage is situated atop the cliffs of Dell Creek surrounded by pine trees and a view of the water. Enjoy the nesting Bald Eagles on property, a sight to see! 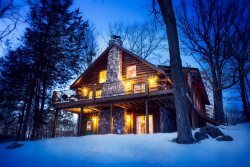 This cottage is only minutes to the Dells attractions yet set away from the hustle and bustle. There is a spiral staircase leading up to a large loft bedroom, full kitchen with dorm-sized refrigerator, living room with wood-burning stove, cable TV/DVD, WIFI, central A/C, one bathroom, dining area with glass doors leading to steep steps down to off-dock fishing and a canoe (weather permitting). Grill, deck and fire pit are included. Very friendly and knowledgeable of our pending arrival and billing questions. The Nord Haus is a very simple property for our needs. Yet we enjoyed the hidden proximity to all the Dell attractions and the quiet neighborhood. Love love loved the property!!!!!! My kids and I had a great stay at Nord Haus. Fantastic outdoor area, great for cookouts and a campfire. The best part of the trip was paddling from the house up to Mirror Lake. We used the canoe provided with the house, and rented a couple of kayaks from the nearby marina. By "nearby," I mean you can actually see the marina from the end of the Nord Haus dock! No driving necessary. Be prepared to portage over a small dam. Excellent trip! Everyone we spoke with was friendly and efficient! Renting a cabin from you was easy and stress free! We had the most wonderful time! Friendly staff, made check in and checkout easy and fast! We loved Nord Haus. It was a cute little house, and we loved the deck and fire pit. It was everything we needed for a long weekend in the Dells! The staff were all very friendly and helpful!!! We all liked the fact of being more in the "country" and being secluded instead of staying at Mt. Olympus. We have stayed at Mt. Olympus the past 6 years and it's just more noisy in the rooms and they are not very big. It was just an overall better vacation just staying here. Thanks!! Easy to work with. Laid back. We had a wonderful time. Hiking, making food, hanging out in the back wooded lot. It was all a great experience and nice to get away from reality. The place was adorable and just what our group needed. Very attentive fro t desk staff when we reported the window leak from the rain. Also it was so nice making the reservation and being able to secure the 2 nights without making a payment till the morning when our flights were secure. Just so helpful and no hassle. We really enjoy staying at Nord-Haus, It is perfect for family of 4, very nice and quiet place for vacation. Fast, professional and knowledgeable stuff. We loved staying in this beautiful decorated and cozy cabin. Great location of the cabin and great overall experience, would repeat. GEORGE IS A DELIGHT AND PLEASURE TO WORK. GREAT JOB ALL THESE YEARS. THANK YOU FOR YOUR WARMTH AND ATTANETION TO DETAIL. WILL COME VISIT YOU SOON AGAIN!!! Office was easily found, property directions we a breeze, and the breathtaking location, and beauty of the outdoors property were well above any of of expectations! Amazed, refreshed, and grateful, for our getaway in a beautiful wooded princely secluded, , extremely well kept, up to date, and totally cozy romantic and rustic Haus! Thank you with the utmost sincerity and we feel so blessed that you shared your property with us while we enjoyed our reconnecting in our marriage! !